Librarian Todd Davis described his elementary school in Oakland on Tuesday as if a tornado went through the buildings during Spring Break, but instead it was vandals. Mark Matthews reports. Librarian Todd Davis described his elementary school in Oakland on Tuesday as if a tornado went through the buildings during Spring Break, but instead it was vandals. Hallways were trashed, windows were shattered and computers broken at Manzanita Community School in the Fruitvale neighborhood after someone vandalized the elementary school some time during the break, according to the Oakland Unified School District's spokesperson. "Microwaves on the floor. The pantry where they get food for families were ransacked and rice was all over the floor. Everything was thrown on the floor. The books, everywhere, was two feet high of just debris everywhere, Davis told NBC Bay Area. The damages are extensive. 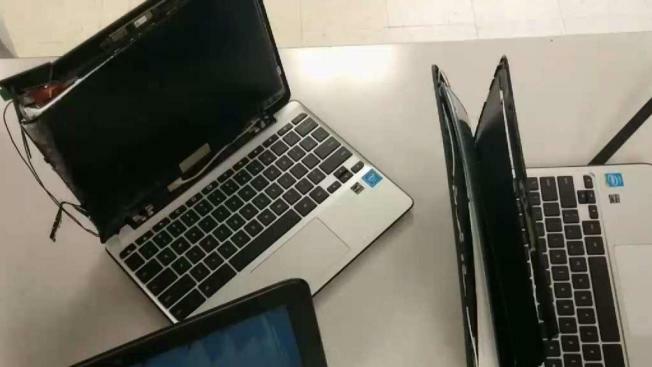 At least three Chromebook laptops were smashed, Davis said. The porcelain toilets in the girls' bathroom were also shattered. Vandals also splattered red, orange and brown paint across the school. District officials say they're looking for help to find the perpetrators who inflicted thousands of dollars in damages. Manzanita Community School serves around 400 Oakland students.